When an alien organism incapacitates Dr. Keller, the team seeks help from an old friend recently revived from stasis. To keep the sleeping Torren calm, Teyla Emmagan has been walking around Atlantis. She pauses in the lab where Dr. Jennifer Keller is studying a formula derived from information in Michael’s database (“Search and Rescue”). The doctor hopes the serum will reverse the deterioration of Dr. Carson Beckett’s organs, allowing him to be removed from stasis (“The Kindred, Part 2”). Keller confides that during the two months Beckett has been in the pod, McKay visits him regularly to share news. Teyla tells Jennifer that Kanaan, the father of her child, is fully back to himself — thanks to a modified version of Beckett’s retrovirus, the Wraith DNA has been stripped out of his body. He is now in a refugee camp on the mainland, and Teyla plans to request that he be allowed to leave. Baby Torren grows fussy, so Teyla moves on. Richard Woolsey, new commander of the Atlantis expedition (“Search and Rescue”), beams onto the control room balcony after a 3-week trip from Earth on the Lt. Colonel John Sheppard and asks for their reports rather than make a speech to those under his new command. Instructing Technician Banks to send all activity reports for the past three weeks and his luggage to his quarters, Woolsey leaves. Keller goes back to work only to awaken, having fallen asleep at her desk. Her right hand is covered in a clear, gelatinous goo. Puzzled, she washes it off. Marie, the head nurse, suggests Keller needs real sleep. Rodney McKay offers her the same advice the next morning as he, Keller, Sheppard, Ronon Dex, and Teyla gather for Mr. Woolsey’s first formal briefing. They have a new table — a 12-foot-long mahogany conference table Woolsey brought from Earth. After congratulating them on dismantling Michael’s organization, Woolsey closes the file on Michael. While there has been one sighting and Sheppard believes Michael escaped in their cloaked Jumper, Woolsey will not spend resources searching the galaxy for one Wraith who may not be alive. He also declines Teyla’s request to let Kanaan go, just yet. Woolsey asks Keller about her other research. Using Michael’s research she has developed a serum that may stabilize clone cells, but she has no way to test it except on Beckett. Woolsey tells her to move forward or to move on. Without further ado, Drs. Keller and McKay remove Beckett from stasis and inject him. Encouraged with what looks like a victory, Keller agrees to get some rest. Carson awakens and shows no signs of cellular degradation. The next day, Keller fails to keep a breakfast date and does not show up for her shift. Teyla summons McKay, who has just broken the news to Beckett that he is being sent back to Earth for rest and observation. Together, the two men join Teyla outside Keller’s quarters. McKay opens the door. They enter, and discover a mass of red tentacles growing out of Keller’s torso. Though still ill himself and not on active duty, Dr. Beckett takes charge. Keller and her bed are moved to an isolation room. Beckett attempts to surgically remove the smallest of tendrils from Keller, but she crashes. The medical team manages to get her back, but no further surgery is possible. There is an alien pathogen in her blood. She was infected on M2S-445 where Michael’s lab was destroyed (“Search and Rescue”). Beckett tests everyone else who was on the planet, and finds that they are all infected, too. Woolsey has them confined, even though the pathogen is not contagious and hasn’t yet manifested in them. Meanwhile, the tendrils have almost completely covered Jennifer and have grown down three floors, drawing energy and materials from the building and electrical grid. When Dr. Zelenka shuts off that source of power, McKay fears the tendrils will head for the Z.P.M. power conduits, like a plant growing toward sunlight. Teyla takes a team to investigate. Attacked by the tendrils when he realizes that the growth is tapping the Z.P.M., Zelenka is rescued by Teyla. Beckett finally recognizes that the tendrils are a bio-polymer with organo-metallic compounds, leading him and Zelenka to speculate that they are the basis of a Wraith hive ship. Keller’s mind is being used to plan, to coordinate, and to defend the growth until it is complete. Beckett quickly develops a phage to attack the pathogen. Woolsey, however, develops the contingency plan of using drones to destroy the isolation room and kill the doctor, as a last resort. To save Keller first, Sheppard volunteers to be a test subject for Beckett’s phage. While it does neutralize the pathogen in John’s system, Carson suggests someone with the pathogen would be more likely to enter the affected building and deliver the serum to Keller. Ronon quickly volunteers. He transports to the building where the Wraith organism is spreading, but soon his path to Keller is blocked by the rampant growth. With no other solution, he attempts to shoot his way in. Now regarding him as a hostile, the organism’s tendrils grab him and pull him to the wall. Ronon is helpless. Fearing just this outcome, Sheppard loads another dose of the phage and heads for the control room. He radios Keller, but instead finds himself talking to the Wraith organism through her. While the others keep her talking, Sheppard flies a Jumper to the infected building — right through the outer wall. He injects Keller, but as a final act, the dying growth stabs him in the stomach. Keller recovers quickly, though Sheppard will take more time to mend. Meanwhile, Carson prepares to return to Earth. Woolsey admits to Sheppard that in his first three days on the job, he managed to violate more than six security protocols. His superiors at the I.O.A. has accepted his decisions, but he is deeply troubled. The rules are his only guide. Richard fears that if he can’t trust the rules, he might not be able to command the expedition. Sheppard smiles, shakes Woolsey’s hand, and welcomes him to the Pegasus Galaxy. The head nurse in the Atlantis infirmary (played by Linda Ko) is named Marie. “We’re at episode two of Season Five [‘The Seed’]. We’re making Jewel’s life misery right now, which is a nice change for me. I’m noticing a theme to Season Five, which is a lot of people strapped to beds. So there’s a little teaser of Season Five. Season Five: A Season in Bed. “I just talked with Paul about ‘The Seed,’ which was written with two important story lines in mind: Firstly, the introduction of Woolsey as the new leader of Atlantis; and secondly, the fact that Beckett is still in stasis. “With respect to Woolsey, Paul explained that Woolsey’s character has always been that of a man who does things by the book. That was the source of his antagonistic personality in SG-1, and what allows him, as a character, to be both a good guy, and an antagonist. But this story needed to teach him that doing things by the book is simply not going to get it done in the Pegasus Galaxy, where the stakes are high and the action intense. VOTE! 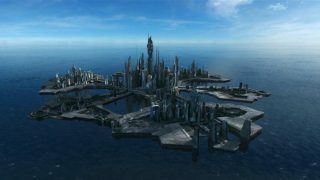 How would you rate Atlantis's "The Seed?"